A diverse percussion loops library of the most requested world percussion styles: Afro-Cuban, Brazilian, funk, hip-hop are among the essential percussion styles presented in this sample download pack. And, for added versatility, you’ll find the sound samples of congas, bongos, surdos, pandeiros, shakers, udus, rainsticks and other instruments. An intense and focused library of essential world percussion samples. Add live percussion loops to your tracks for that rhythmic flavor your tracks need! 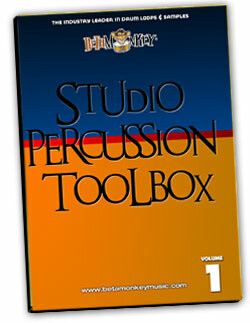 Add the flavor of popular world percussion loops with Studio Percussion Toolbox. Beta Monkey Music brings a wonderfully diverse cross-section of the most sought-after and requested percussion loop styles to your music. Afro-Cuban, Brazilian, funk, hip-hop and more popular styles have been captured to perfection and ready to enhance and inspire your songwriting. And, to give your music even more, you’ll find the finest sounding samples of congas, bongos, surdos, pandeiros, shakers, udus, rainsticks and other instruments in one intense, focused library of essential world percussion drum loops and samples. This is not our biggest drum sample library, but certainly our most diverse. Full Range of Percussion Loops: Do you need funk, swing, Brazilian, Afro-Cuban, or hybrid percussion styles? All of these essential live percussion will inspire your music. With tempos ranging from 70 BPM to 140, the Studio Percussion Toolbox covers the most essential and sought-after percussion grooves and put them at your fingertips. Ensemble and Component Drum Loops: Each percussion loop folder contains both the discrete individual voices as well as mixed ensemble group loops. Use the “mixed” loops as is for instant groove inspiration or create endless variants using the included solo voice loops. Lots of room for creativity and further customization. Superior Rhythmic Realism: No stiff unnatural grooves. Live performances by one of Brazil’s top percussion masters. You want the authentic heart and soul of a true native player? You’ve got it. Matching Percussion Samples: Enhance and customize the percussion loops with a complete matching sample collection of all the percussion instruments. Create your own virtual instrument and create unlimited percussion loops and tracks. What sets the Studio Percussion Toolbox apart from the usual percussion loops you find included with your DAW or on free sites? These loops are usable, with no wildly showy performances of a percussionist showing off. Each loop captures solid percussion rhythms, 100% live acoustic performances that you’ll actually use in your songwriting. To be sure, the focus is on essential staples of percussion performances. But, we also included some diverse and grooves that you will not find elsewhere. You’re getting authentic world percussion loops. We tapped the expertise of one of Brazil’s most respected and sought-after percussionists to record and capture these grooves. You’ll have even greater options for more percussion grooves. Use the included samples of all instruments captured in the loops in any drum virtual instrument. 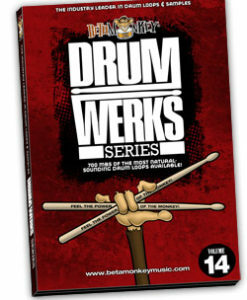 Create new grooves or blend them with the existing drum loop performances. The only limit is your imagination. 15 unique percussion loop sets of essential popular world rhythms, all ready to add some much-needed percussive flavor to your tracks. The Studio Percussion Toolbox will be the percussion loop collection you’ll reach for every time your tracks call for that little something extra. Percussion loops feature the following instruments: Agogo, Berimbau, Bongos, Clave, Congas, Cuica, Darbuka, Djembe, Dumbek, Guiro, Palito, Pandeiro, Repinique, Shaker, Surdo, Talking Drum, Tamborim, Timbale, Tumbao, Udu, Wind Chimes! Samples and loops. All in all, it’s time add some tasty flavor to your percussion tracks! PLEASE NOTE: This loop collection has been previously released until the title “The Cornerstone Sessions” through Natural Grooves. We’ve acquired the rights to release it now, until new title, packaging, and formatting. Wow you get Sooooooo much for your money at BETA MONKEY. !! These percussion tracks /loops are mixed so well. Near perfect with stereo effect at times. Very useable, easy to use and varied in style, tempo and intensity. Trust me, Don’t go anywhere else for percussion loops. These are the best, I researched many other loops. These are the best.